Real food. No grains. No legumes. No dairy (except butter, of course)! The basic idea is to eat like a caveman. Now, please do not take this too literally. I know there is no wooly mammoth meat at Whole Foods... But eat the types of foods that would have been around in pre-agricultural times. Think meat, fish, eggs, vegetables, nuts, seasonal fruit... Paleo is in many ways the most restrictive of the vintage diets. If you don't love cheese and cream, Paleo might be for you. (Most versions of the Paleo diet permit grassfed butter.) 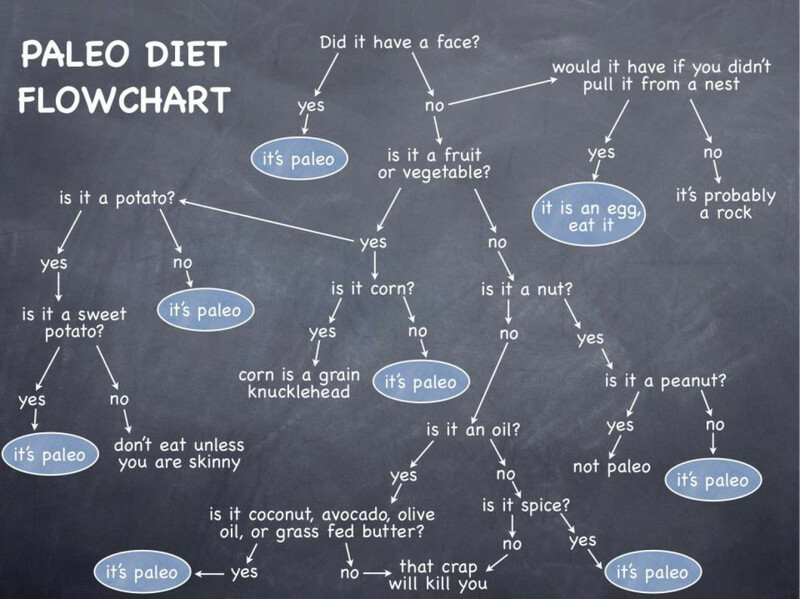 There are at least a couple of million Paleo eaters in the US, so there are lots of books, recipes, products, and services to help you find your way. A classic. Basic... funny... approachable. Wolf does a nice job of giving you a plan for a healthy life. A newer perspective on Paleo, with a feminine edge. Wolfe even includes some tips for perfect cavegirl skin care. More than a cookbook. Pittsburgh's own Paleo experts provide delicious recipes and tips for Paleo lovers. Primal is essentially Paleo plus high-fat dairy. Like Paleo, but a little easier for those of us who like to eat some cheese and cream. Mark Sisson is a well-respected member of the ancestral health community, and his books dominate the Primal arena. Another classic. Lots of insights, easy to understand, and fun to read. Mark makes compelling arguments but keeps it simple. More from Mark; this plan is nicely illustrated on an info- graphic. Paleo, but smarter (and with white rice)! The Doctors Jaminet, both PhD's who successfully battled their own chronic illnesses with a Paleo inspired diet, bring their scientific discipline and outlook to this logical and well researched way of eating and living. They offer a dietary path to wellness that is vintage Pacific Islander(ish). The Perfect Health Diet's food prescription takes the shape of an apple (see below.) Beautiful. A balanced, whole food approach to weight loss and vibrant health. Unlike most Paleo diets, it includes white rice, so it is great for those who like Asian food. Perfect Health retreats offer a chance to eat, move, live, and sleep for Perfect Health. Practice makes perfect! Traditional food for vibrant health. Weston A. Price was a dentist who traveled the world in the mid-nineteenth century, visiting aboriginal cultures in hopes of learning what constitutes an ideal diet. He examined the health (and the teeth) of native cultures following traditional food ways, and took careful notes on their diets and their health. Price's foundation, WAPF, is dedicated to preserving and spreading the wealth of knowledge Dr. Price gathered before many of these traditional cultures disappeared. So much more than a cookbook. The bible of the WAPF, written by Sally Fallon, the Foundation's president..
Dr. Cate Shanahan, now advising the LA Lakers about what to eat (hint: not Doritos), offers WAPF inspired dietary wisdom in her book, Deep Nutrition. Farmers' daughter Nina Planck gets real with her WAPF inspired yet simple guide to eating right. Hot off the presses (just released April, 2015), The Wild Diet is Fat-Burning Man Abel James' blueprint for vibrant health and six-pack abs. Complete with old family recipes tweaked for better health, this real food manifesto shows you how to indulge in mouthwatering food yet stay lean, strong, and free from chronic ailments. ABBA. IKEA. LCHF. Four letters - all caps - acronyms - and all from Sweden. Roughly 25% of Swedes now follow this real food, high-fat solution to better health and easy weight control. Millions of neighboring Norwegians have also found this path, as well as distant Australians and South Africans (who call themselves 'Banters'), as LCHF goes global. And guess what? Obesity and heart disease are declining in Sweden. For a thorough post on low-carb from a 'daddy blogger', check out Health Daddy's post: Low Carb Diet: The Beginners Guide. Dr. Andreas Eenfeldt's best selling book is now available in English! He shares all or most of his wisdom on his website! Jimmy Moore has been there, but lost almost 200 pounds on a LCHF diet. Hear his story and learn about his views on how to lose weight and feel better. Dr. Eenfeldt makes his viewpoint clear in this well-crafted ~50 minute lecture, complete with some Q&A at the end. This talk was recorded at the Ancestral Health Symposium in 2011. Dave Asprey is a self-proclaimed 'biohacker' with lots of ideas (and data) about how to maximize mental and physical performance. He has spent hundreds of thousands of dollars trying to 'hack' his own biology, and likes to share his expensive test results with others! And, he knows what it is like to struggle with weight -- he used to weigh 300 lbs. You can think of Dave's advice about food as vintage inspired with a modern edge. Real food. More fat. But with some tweaks for cutting edge performance. If that sounds good to you, this is your diet/lifestyle. Bulletproof partying... What to drink and how to hack your hangover. Supercharge your morning with Bulletproof Coffee for breakfast. Here's why! 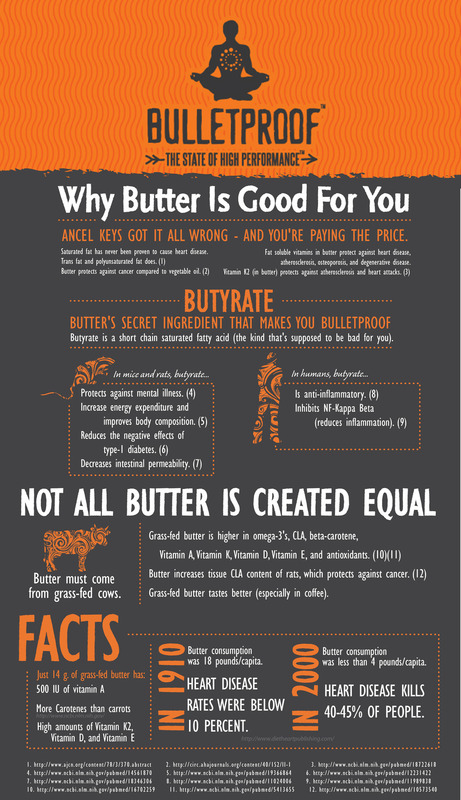 Bulletproof expert explains the virtues of -- you guessed it -- butter! How appropriate!